As a part of the global agenda to realize the potential of cleaner and greener fuels – those that reduce the dependence on fossil or foreign fuels – American Power Group, Inc. has created exciting new technologies that deliver smarter fuel solutions. The Dual Fuel solutions allow customers to realize a net fuel savings of up to 45 percent depending on application and natural gas fuel type. American Power Group (APG) provides a cost-effective patented Turbocharged Natural Gas conversion technology for vehicular, stationary and off-road mobile diesel engines. 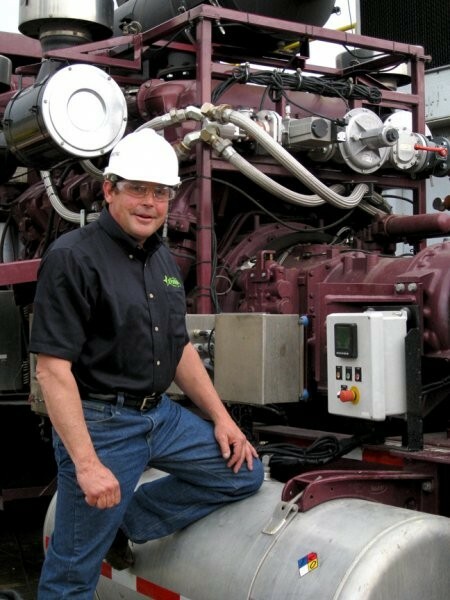 APG’s dual fuel technology is a unique non-invasive energy enhancement system that converts existing diesel engines into more efficient and environmentally friendly engines that have the ability to run on diesel fuel and natural gas simultaneously, with the flexibility to return to 100 percent diesel fuel operation at any time. The proprietary technology seamlessly displaces up to 75 percent of the normal diesel fuel consumption with the average displacement ranging from 40 to 65 percent. The energized fuel balance is maintained with a proprietary read-only electronic controller system ensuring the engines operate at original equipment manufacturers’ specified temperatures and pressures. Installation on a wide variety of engine models and end-market applications require no engine modifications unlike the more expensive invasive fuel-injected systems in the market. APG’s non-invasive fuel system allows the diesel engine to maintain it’s original integrity, power and torque, while providing up to a 45 percent reduction in net annual fuel costs. Experience has shown that the dual fuel mode of operation has the potential of producing efficiencies and maximizing output that can surpass those obtained with traditional diesel operation. However, in order to maintain the integrity and reliability of the engine, certain protective measures must be put in place to provide the best of both the dual fuel operating system and the traditional diesel engine operation. APG’s dual fuel technology does not de-rate the base diesel engine. Full power is maintained by providing the necessary BTU energy to the engine as needed. The combined combustion of natural gas and pilot ignition diesel fuel provides superior energy efficiencies when compared to each fuel individually. The engine does not lose horsepower when operating on dual fuel mode because the system maintains OEM compression ratio values, peak horsepower and efficiency levels of the upgraded engine remain on par with 100 percent diesel operation. APG’s Dual Fuel System does not interfere with the engine integrity. The technology has been designed to allow for in-field upgrade of the diesel engine without the need to change or modify its existing design. The conversion hardware is mounted externally on the engine and does not require modification of the engine or alteration of any critical engine parameter. APG’s proprietary software resides in it’s own ECU and stands alone of the OEM controller, taking a read-only position through the CANBus network in order to monitor engine parameters. APG’s system has been designed to maintain OEM specifications of all engine temperatures including engine coolant temperature, oil temperature, exhaust gas temperature and intake air temperature. Should the engine become close to meeting a monitored threshold, APG’s Dual Fuel System will read such parameter and automatically shut down, only to re-engage automatically once all monitored data points are within safe operating parameters. The dual fuel system replaces diesel fuel normally consumed by the engine with an equivalent quantity of natural gas relative to the heat value of each fuel. As such, engine air fuel ratios during dual fuel operation remain largely equivalent to 100 percent diesel operation, resulting in normal peak exhaust gas temperatures and associated peak engine thermal loads. Efficiency under dual fuel is maintained as the system replaces diesel fuel with an equivalent energy (BTU) amount of natural gas. This process results in the same net fuel burn versus load as would be experienced during 100 percent diesel operation. The dual fuel mode has no negative effects on engine wear rates and durability. Engine thermal loads are equivalent to 100 percent diesel operation hence no excess wear of the combustion chamber components (pistons, rings, valves, injectors and other parts) occurs. As no changes are made to the base diesel engine, OEM compression ratio, cylinder heads, or basic diesel parameters, the operation on dual fuel can be switched to 100 percent diesel operation in a seamless manner without impact to rpm and Hz. Should the supply of natural be interrupted the system switches to dedicated diesel operation automatically. APG’s Turbocharged Natural Gas Technology is emissions compliant according to EPA anti-tampering regulations. In September of 2012, Collicutt Energy Services entered into a Certified Installer and Dealer Agreement with APG to continue leading the industry with innovative solutions for the power generation and gas compression industry in Alberta and Western Canada. Collicutt adds the APG’s Stationary Dual Fuel Conversion training and certification platform to their 30-plus years of experience in design and engineering services amongst many other facets within the power generation industry. Collicutt is offering APG’s proprietary Turbocharged Natural Gas Dual Fuel Technology to stationary clients, who typically see system payback occur within six to nine months depending on application and fuel source.